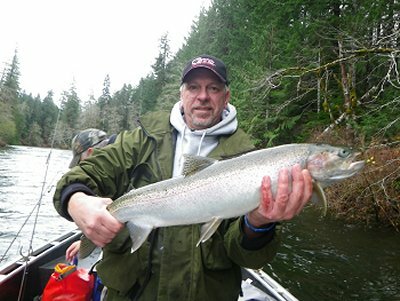 12th March 2013: FISHING REPORT: Port Alberni Inlet, Barkley Sound, Ucluelet (West Coast), Somas-Stamp River System. The Spring and summer salmon sport fishing season for 2013 is closing in on us ever so quickly. It is almost mid-March and it is spring break for many people. This is also a time that avid sport anglers begin spending some time winter Chinook fishing or fishing local rivers or lakes for Steelhead and Trout. Many of us are saying farewell to winter and the many Pacific storms that often batter the west and east coast and inland areas of Vancouver Island British Columbia. March on the west coast and central Vancouver Island and Pacific Rim areas presents one of the biggest festivals on the British Columbia West Coast. The festival is better known as the Pacific Rim Whale Festival and this year begins on March the 16th and continues to the 24th of the month. The festival celebrates the official kickoff to the beginning of the whale watching season in Ucluelet and Tofino. The magnificent waters between Ucluelet and Tofino witness the migration of over twenty thousand Gray Whales as they make their thirteen thousand kilometre journey from Mexicos Baja Peninsula to the Bering Sea. This marks year twenty-seven for the Pacific Rim celebration which has well over sixty events to enjoy. The first weekend of March celebrated the first salt water fishing deby of the year. This derby was the twenty-fifth annual Sproat Loggers Derby and was once again hosted out of Poett Nook located between Sarita Bay and Bamfield. The derby was enjoyed by just over 400 entrants who braved horrible weather on the Saturday but were treated to spring like conditions on the final day of the Derby which saw a twenty-six pound chinook win the top prize which was a ten horsepower Yamaha motor donated by Port Alberni’s Port Boat House. 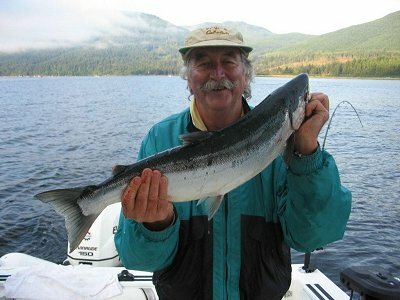 All Sport Anglers will be pleased to hear that the salmon sport fishing opportunities in British Columbia will again be relatively good in 2013. 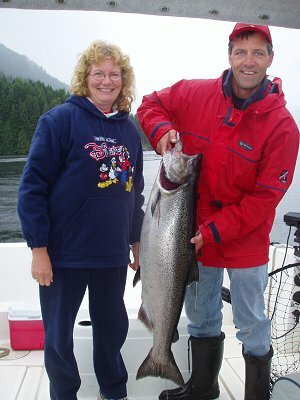 Many locations on Vancouver Island coastal and inner waters should have some of B.C.’s best salmon fishing. The 2012 year was good with Sockeye number to the Alberni Inlet maximuming at about 860,000 pieces and Chinook and Coho in Barkley Sound were very good in June and July. Some of the biggest Chinook were landed in August offshore and also in the Alberni Inlet during the last two weeks of August and first few days of September. We have been fortunate that the survival of fry and young salmon due to the La Nina cold water phenomenon has greatly affected the salmon survival in the North Pacific. This water condition for the salmon will again be responsible for 2013 healthy returns in British Columbia and the Pacific North-West. 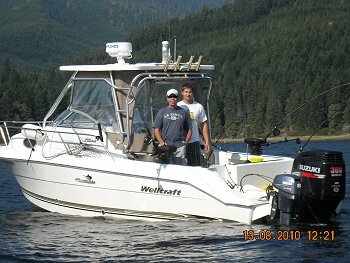 This is great new for sport fishing on British Columbia’s West Coast. The Port Alberni Inlet will not wake up until mid June when sport Sockeye fishing should be well under way. Sockeye numbers in pre season estimations are believed to be very close to figures in 2012 which was approximatley 860,000 pieces. Sockeye fishing is a great family adventure and is fun for young and those not so young. The early Sockeye return to the Somass River often begins in late May. 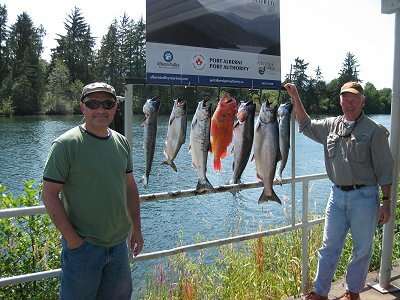 Sport fishing for these number one commercial salmon in the Port Alberni Inlet is usually well underway by the 15th of June with the peak of the season occurring the second or third week of July. Limits this year if all goes well should be four per person with a total of eight sockeye in possession which is a two day limit. The Chinook returns to the Inlet are also forecast to be similar to 2012 and approximately forty thousand Somass River Chinook are expected to return to the System. Coho returns should be average for returns at thirty-five to fifty thousand fish. Barkley Sound is fishable year round due to the protected coastlines on both the east and west sides. The winter Chinook fishing during February was hit and miss. There has not been a lot of bait in the area. The feeders will most often be found where there is bait. The weekend of March 2nd and 3rd was the Sproat Lake Derby and with just over 400 entrants fishing the many fishable areas of the sound. Derby headquarters was Poett Nook. There were some nice sized salmon landed to nicely kickoff the early spring salmon fishing season. The three largest Winter Chinook landed were twenty-six, twenty-one, and seventeen pounds. There were several teenagers and also fish in the seven to ten pound range which are just perfect for the early spring or one might say late winter barbeque. The largest salmon of the derby was landed at Alma Russel on the Sunday. The runnerup was twenty-one pounds was landed in horrible weather on day one of the derby at Vernon Bay. One Angler also had some good luck at the same location where the derby winner was landed on day two of the derby and landed three winters that weighed fourteen, twelve, and ten pounds. Anchovy in a chartreuse Rhys Davis teaser head trailing a green glow hot spot flasher was working very well. Swale Rock (a lot of shakers), Vernon Bay, and the Vernon side of Canoe Pass also had some good fishing with many of the fish in those areas weighing seven to ten pounds. Areas of the Bamfield Wall, Kirby Point, and Tzartus Island all had some small feeder Chinook with plenty of Shakers. Yankee Bay and Sarita Bay also had a number of small feeders and a few ten pound salmon. For some anglers anchovy just was not working but hootchies in the green glow and spatterback were working as were green glow three and a half and four inch coyote spoons behind glow flashers. When using hootchies in the winter it is best to shorten up on leader length. During the summer season most anglers fishing with plastic keep their leader lengths at forty-two to forty-three inches. Shortening up two to four inches is always a good idea when fishing in deep water during the winter. The fish were deep as is normal with the feeders in one-hundred to one-hundred and forty feet of water in many locations of scenic Barkley Sound. The salmon fishing in Barkley Sound during March, April and the first half of May should really pick up as the feeder Chinook move in with the herring spawn and the early summer run of Chinook are beginning to make their way to southern watersheds. Ucluelet will be a busy community beginning March 16th which is also the first day of Spring Break. The communities of Ucluelet and Tofino from the 16th to the 24th of March will be celebrating the beginning of the Whale Watching season. Many events are planned for each day and many are free but some do have a minimal charge. One of the biggest features of the Pacific Rim Whale Festival is the Chowder Chowdown which will occur from 11am to 2 pm in the Ucluelet Community Centre on Sunday March 17th. The fishing out of Ucluelet is always a bit iffy in the winter in terms of being able to get out on the water. There are always some good days but most fisher people stay relatively close to the Ucluelet Harbor. With spring approaching the weather patterns begin to change and each advancing month will provide more opportunity to fish further away from the coastline. The Alley, Mara Rock, and Great Bear have had a few nice feeders landed over the past few weeks. Some anglers have headed up Peacock Channel and have been fishing the protected waters of Mayne Bay, Lyle Point, and the back part of Swale Rock and have had some success on small feeders from seven to ten pounds. One angler this past week had a wonderful day with a flat calm ocean and landed two fourteen pound Chinook. Using a needle fish hootchie and an army truck glow hootchie the two chinook and two other Winter Chinook which were lost close to the boat slammed into the army truck glow hootchie trailing behind a betsy flasher. The fishing should improve in the inshore areas as the herring will head to the beach to spawn. Where there is bait one will find the Winter Chinook. The west coast should expect some great feeder Chinook fishing right until April. The early run of salmon headed to the big watersheds to the south should begin to show by mid April which should be the beginning of a fabulous summer of fishing. Information will be given on the Ulcuelet Ladder Derby in future reports. The Stamp River is in good condition in terms of water level and color. The fishing pressure on the Stamp has really declined since the beginning of January. The fishing is really spotty. Guides have had a few days where they are hooking into a few Steelhead and landing two and some days a third fish but there are other days where it is not very good. The system has seen few new fish come in as of late. People on foot fishing in the Upper River have had a little success on a trout bead and white wool. Pink Worms right now would also be good. 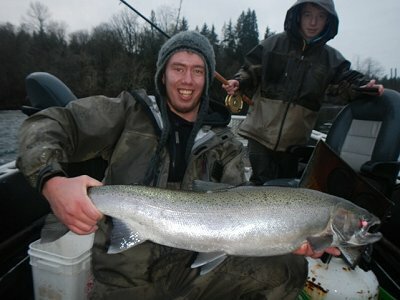 We definitely are hoping that in March that the late run of Winter Steelhead will come in. In April there is often a late run of fresh fish and of course the spawned out Steelhead will be making their way back down the river and headed back out to the Pacific Ocean.